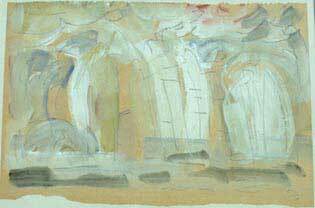 The major contribution of Mark Tobey to twentieth century art is still inadequately appreciated, perhaps because he never tried to market himself or his art as did many of his contemporaries. He drew inspiration and technique from many cultures of East and West, from cities, nature and science, and created art that broke new ground and influenced many other artists. 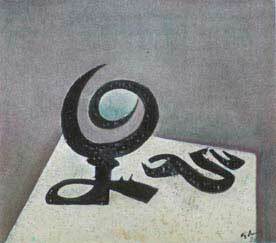 In particular, his efforts to reflect spirituality in art set him apart from his secular century, but will ensure that he is remembered long after most of his contemporaries. He accepted the Bahá'í Faith in 1918 and, for the rest of his life, Bahá'í principles and concepts interacted with his sensitive soul and creative imagination as he sought new ways to express what he felt and experienced. The art that he has left to humanity reflects that life-long journey. It resonates with our spirits and enriches our lives. 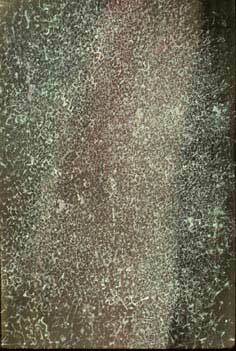 My interest in Mark Tobey's work is lifelong, because I grew up in a house full of his paintings, and have lived with them ever since. My parents, Joyce and Arthur Dahl, were also Bahá'ís and close friends of Mark, and their collection grew over the years to 100 works. I photographed all of them so that I could give lectures on Mark and his art. I myself met Mark on several occasions, the last time in Basel a few years before his passing. 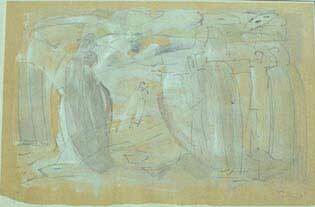 I was a student in France at the time of his great retrospective in the Louvre in Paris in 1961, and spent several weekends admiring the 286 paintings gathered there. Since then I have tried to visit as many of his expositions as I could, and have personally seen and studied over 500 of his works. 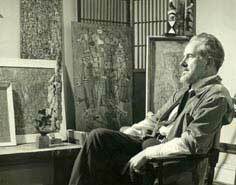 The best web site for information on Mark Tobey is maintained by the Committee Mark Tobey at http://www.cmt-marktobey.net. It includes a full chronology of his life, a comprehensive listing of expositions of his work, and an extensive bibliography. 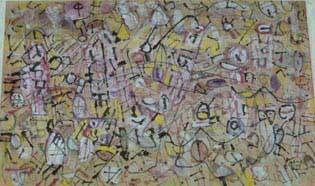 Therefore my page here only tries to provide a brief introduction to Mark Tobey, in the hope that others will be attracted to his art and pursue their interest further. While there are many published catalogues of Tobey exhibits and some books on him, most are difficult to obtain today. 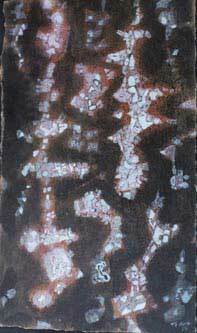 One recommended work is Mark Tobey: Art and Belief, by Arthur L. Dahl and others, published by George Ronald, Oxford, 1984. In includes my article The Fragrance of Spirituality, originally published in The Bahá'í World, Vol. XVI, 1978. 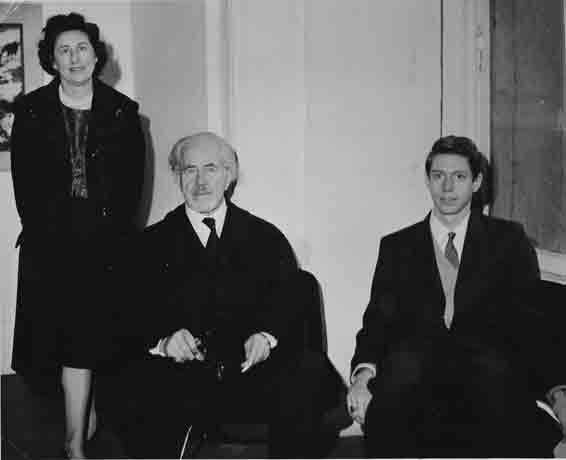 In the 1930s he moved to England to Dartington Hall, where he met the potter Bernard Leach and taught him the Bahá'í Faith. Together they travelled to the orient, where Tobey spent time in a Zen monastery and studied calligraphy. "In a broad comparison between Eastern and Western Art it could be said that in the East artists have been more concerned with line and in the West with mass. Certainly the Eastern artists were far from the Renaissance concept as expressed by my Chinese friend who observed, 'The Western artists' paintings are framed holes.' Of course today the illusionistic style is dead and has been for some time. One hears it said often that Picasso marks the end of the classic period in the West. Where then shall we turn? "A few decades ago we went to the galleries to see herons in the marshes, winter scenes at twilight, apples on a table. Nowadays we go to see lines, squares and great squashes of paint. Much that passes as abstract art whether in Asia or the U.S. and Europe is not necessarily related to Simplicity, Directness, and Profundity. Perhaps if we omit the last word, the other two tally. That abstract art has in many ways become an Academy appears certain. But somewhere in this and in what we saw before, there were a few paintings that radiated the spirit and it is these we seek, no matter what garment is worn. 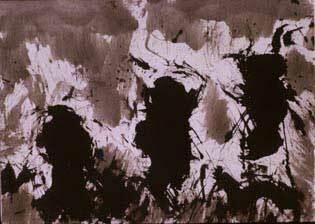 When I resided at the Zen monastery I was given a sumi-ink painting of a large free brush circle to meditate upon. What was it? Day after day I would look at it. Was it selflessness? Was it the universe - where I could lose my identity? Perhaps I didn't see its aesthetic and missed the fine points of the brush which to a trained oriental eye would reveal much about the character of the man who painted it. But after my visit I found I had new eyes and that which seemed of little importance became magnified in words, and considerations not based on my former vision. When I saw a great dragon painted in free brush style on a ceiling in a temple in Kyoto I thought of the same rhythmical power of Michelangelo - the rendering of the form was different - the swirling clouds accompanying his majestic flight in the heavenly sphere were different but the same power of the spirit pervaded both. "'Let nature take over in your work.' These words from my old friend Takizaki were at first confusing but cleared to the idea - 'Get out of the way.' We hear some artists speak today of the act of painting. This in its best sense could include the meaning of my old friend. But a State of Mind is the first preparation and from there this action proceeds. Peace of Mind is another ideal, perhaps the ideal state to be sought for in the painting and certainly preparatory to the act. "In China and Japan I was freed from form by the influence of the calligraphic. I already knew this means of expression when I was living in Seattle. I studied this calligraphic method with Chinese painter Ten Kuei. I did not go to China or Japan to find something for my works, I went there because I had the opportunity to do so. Tobey experimented with many styles and media, inventing what has been called white writing as a way of expressing light, such as the city lights in his famous "Broadway Boogie" of 1938. "I am accused often of too much experimentation, but what else should I do when all other factors of man are in the same condition? Shall any member of the body live independently of the rest? I thrust forward into space as science and the rest do. My activity is the same, therefore my end will be similar. The gods of the past are as dead today as they were when Christianity overcame the Pagan world. The time is similar, only the arena is the whole world. To make a living he taught art, and for most of his life he received little recognition, with small shows on the West Coast and in New York. While living in Seattle, he spent much time in New York and associated with the artists who became the abstract expressionists of the New York School. His own work had a significant catalytic influence on painters such as Jackson Pollack. 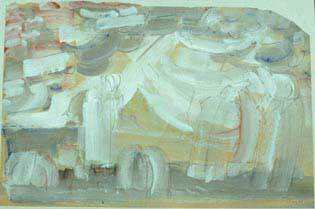 Yet his work remained highly varied as he experimented constantly to the end of his life, and he never developed a consistent style. 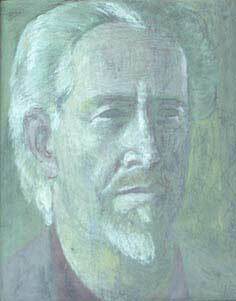 Tobey's first real international recognition came when he won the Grand Prize for Painting at the Venice Biennale in 1958. He was then 68 years old. In 1961 he was honored with a major retrospective in the Louvre in Paris, followed by another in the New York Museum of Modern Art in 1962. He was then considered in Europe to be the greatest living American painter, yet he was still almost unknown in his own country, which was not attuned to the spiritual dimension of his work. 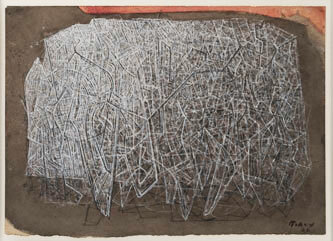 Tobey moved to Basel, Switzerland in the early 1960s to escape the effects of his success, which had made it too hard to concentrate on his painting. 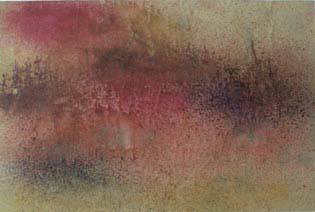 He continued painting until he was over 80, still experimenting with new media. 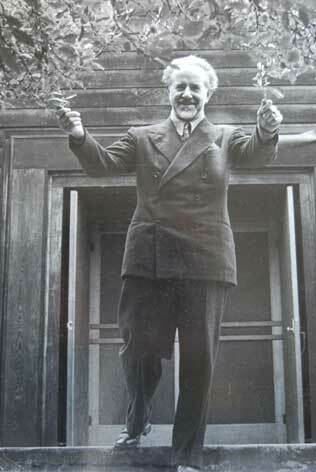 He died in Basel in 1976. Of course, the above quotations can only give a little idea of Tobey's artistic "language" and what he was trying to express. The next step is to see and experience his paintings, and this also takes some time. 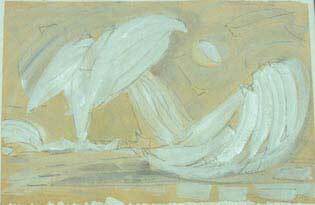 As Lionel Feininger said of Tobey: his paintings contain the element of time, they unfold their contents gradually. 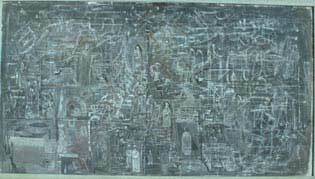 One interesting connection between artists is the inspiration that Mark Tobey's painting "Lovers of Light" provided to the Canadian architect Siamak Hariri in the conception of the Baha'i House of Worship in Chile, which I discovered in 2008 (see separate page). These are my own photographs of the original paintings, so the quality is not very good.